TUGGO DOG TOYS, LLC, a new leading pet toy manufacturing company operating out of Hendersonville, TN and currently participating in the Las Vegas SuperZoo and ASD trade shows for new pet product, is now looking to recruit retailers and distributors for its premier Tuggo branded toy products. Our products sell best with a live demo so we created a display that gives customers that experience inside a store setting. The Tuggo Dog toy company recently won the Becker’s Best in Show award at Global Pet Expo 2014 in March for its new pet toy Tuggo. Now, they have just added the Tuggo mini, a 7-inch version of Tuggo for smaller dogs! Fellow trade show participants and visitors are showing tremendous interest in their dog toy products. Tuggo is a new one-of-a-kind dog toy that uses weight to provide tension for dogs. The design is a hard, hollow plastic ball with a rope going through the middle that can be pulled from either side providing the tug-of-war effect. Additionally, the Tuggo has a recessed screw cap allowing the ball to be filled with water. Adding water inside the ball makes the Tuggo have a sloshing sound when it is being played with. This keeps your dog interested in the Tuggo for hours! When completely full of water, the Tuggo weighs approximately 20 pounds. This weight provides the tension that helps promote exercise and build muscle. 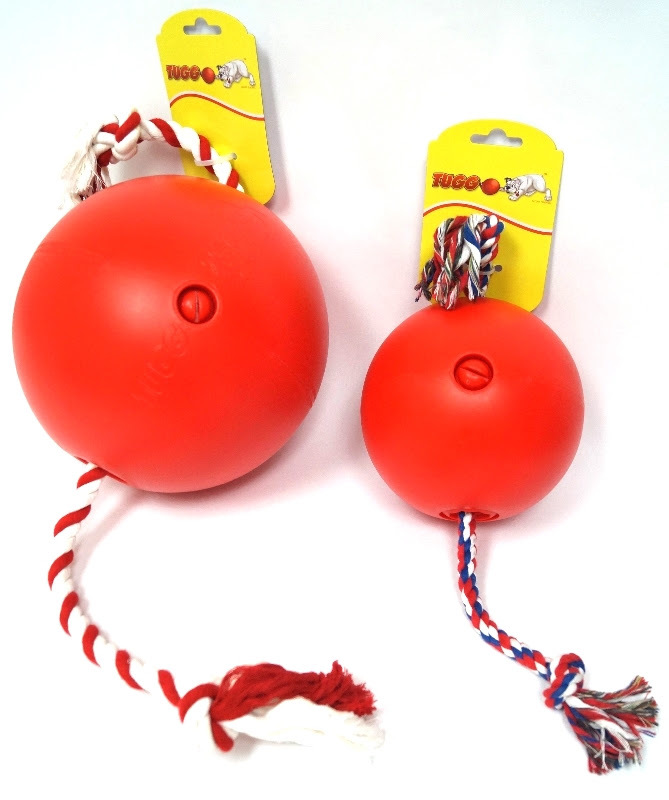 “With this unprecedented level of interest in our dog toy products, we anticipate there will be a great demand in the weeks and months ahead, and in seeking to take on more retailers and distributors, we are being proactive and putting measures in place to deal with the expected demand,” said Adam Harrington, inventor and owner of Tuggo Dog Toys, LLC. Tuggo Dog Toys, LLC will also introduce their new Tuggo Dog Toy retail display that will feature a 10 inch motion activated LCD screen. They hope this will help retailers across the U.S. sell more of their products. “Our products sell best with a live demo so we created a display that gives customers that experience inside the retail store. If we can create a display that will help store owners sell more and profit more, they will re-order, which in turn will allow our company to expand to even more products,” said Adam Harrington. Two of the best features of the TUGGO dog toy products, according to Adam, include their durability and uniqueness. “They are DURABLE in the sense that persons will no longer have to continue wasting money on dog related toys that are chewed up in five minutes or less. To date, not a single prototype has been destroyed,” said Adam. Other sought after features of the products include a rope that can be pulled from either side, which is great for single or multiple dogs. The weight of the ball, which provides the tension for the dogs to engage with, is customizable to the point where up to a maximum of 20 pounds of weight can be added to provide greater resistance to the exercise of one’s dog. The weight can vary depending on how much water you want to add.